Not too long ago, the most respected Naga people were the ones who could hunt the most heads. The more kills a warrior had, the more respect he had in his village and it translated into everything from the ornaments he wore to the shawls and the house decorations that could be displayed. Headhunting is a tradition that has died out but there seems to be new modern ways where Nagas can earn respect at the cost of others. Corruption: Another form of Headhunting? 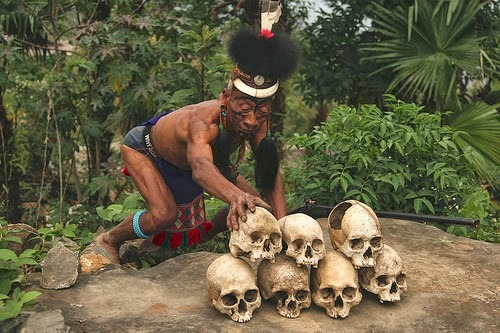 Headhunting practice was not a practice unique to the Nagas but it was practiced in other parts of the world as well. It was a culture which existed in parts of Oceania, South and Southeast Asia, West and Central Africa, the West Germanic peoples, the Norse and Scynthians of ancient Europe. It also occurred in Europe until the early 20th century in the Balkan Peninsula and to the end of the Middle Ages in Ireland and the Anglo-Scottish border regions. In this article, I look specifically into the Nagas practice of headhunting and the responsibility of society after its discontinuity. Head hunting was practiced among the Nagas before the nineteenth century. The sources we have today for looking into the culture of head hunting among the Nagas are the colonial and anthropological sources and the material remains in the form of ornaments and head skulls which are still preserved in some villages. Head hunting is referred to the practice of taking a persons head. It was, however not just a barbaric act of violence but an act deeply associated with religious, traditional and cultural connotations among the Nagas. A number of colonial writers have viewed the practice of head hunting as barbaric and savage as the heads taken were not just of men but of women and children too. Headhunting was also conducted not just during the period of war but was often done in the form of surprise attacks on enemy villages. They were encouraged and rewarded because they checked and kept their enemy villages at bay or avenged their mates by attacking these villages. The heads of women and children were also collected and these heads were considered to be of more value as it proved that men had been successful in reaching into the most protected regions of a village. Attempts have been made by various Naga scholars to do away with harsh comments and notions made on their history and rightly so because looking at the time period and the circumstances one cannot term the practice as ‘evil’, ‘barbaric’ or ‘an act of blood thirsty savages’ because the reasons for men taking part in this activity was actually quite reasonable for the men at the given time frame. On the other hand, some Naga scholars have reasonably argued that killing in any form was evil be it through headhunting or through bombing and shooting in wars. The reason why I suggest that headhunting was not a barbaric or a savage act (though killing in itself is a strongly unacceptable crime in any society) is because the factors that led Naga men to participate in head hunting almost justified their not so pleasing tradition of taking peoples head as trophies. The practice of head hunting among the Nagas was a means to achieve honor, prestige and respect in the society and community. There were a number of attractions for Naga men to participate in this activity of headhunting as he could achieve new status of a warrior in his village (the Konyaks had a special term called ‘Naomei’ for men who took heads during raids). He would be privileged to wear special ornaments to symbolize his valorous deeds, also specially designed clothes which were woven could now be worn by him and his wife gave him a special position in his village as a head hunter. The Nagas could on two special instances earn great individual prestige: one was by taking of human heads and the second by giving of Mithun feast. The prestige, value and meaning of these ornaments and special woven clothes lost its meaning and significance with the coming of Christianity after which headhunting was discouraged and people began to have a new perspective on this practice. However, before the arrival of this new religion people who wore these special ornaments on village festivals were greatly respected. Public admiration and respect is a thing which humans will never tire of. The approval that they earned from their deeds encouraged them to continue this tradition of taking heads. However the special significance of the ornaments began to lose meaning around 1900’s as people started wearing them without much thought. One reason for this was the coming of new religion Christianity and the discontinuity of the practice of headhunting. When we look at the benefits that a man and his family gained through head hunting, we realize the significance that head hunting had for a young Naga men in his village. On taking a closer look at this tradition of headhunting, although it appears violent, barbaric or savage, the subject is actually merely a responsible act by men who were looking for approval from the society. They were not only responsible for protecting their village through headhunting but were motivated by the special honor and prestige that they would achieve through their valorous act of merit. And the men for one were not at fault for taking the lives of people. The tradition of headhunting was continued in the society as long as there was approval and encouragement from the village community. There are certain vices which are prevalent in our society today and other societies as well, which we need to get rid of. One such vice is in the form of corruption. It is present not just in our state but everywhere else. The difficulty that I see in removing this vice in our state for one is the continuous support that has been given to our corrupt officials and leaders directly or indirectly. When these corrupt officials bring in their huge booty in the form of lakhs of rupees as donations to public organizations or churches, they are celebrated and welcomed without being questioned as to where the money has come from. In this way, we are encouraging people to be corrupt and sometimes by asking them for donations we even force them to steal from public treasury. Can we as a society encourage honesty by not giving honor just for the sake of money? If we as a society reacted differently we will be taking one step towards removing this growing tradition of corruption. Before corruption becomes an imbedded tradition we need to remove it from our society. Change is not impossible but is in fact the only thing that is permanent so we need to have a positive mindset and put in all the effort we can together to bring about positive change in our society. Society has the responsibility of removing traditions or continuing them, as we see in the case of headhunting. The moment society turned away its approval, headhunting became history. There is great power that society wields in forming traditions for a society. We as a society, with our approval, can remove or lay foundations for traditions.